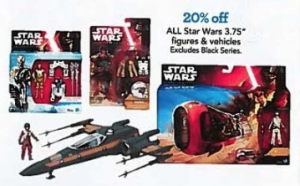 Also part of the Toys”R”Us Great Big Book of Awesome 2015 is their “20% off all 3.75″ Star Wars Action Figures and Vehicles” sale. They do state that this promotion excludes 3.75″ Black Series products, which if your store is like mine, covers the older stock orange and blue TBS figures as well as the exclusive Black Series Battle on Endor and Jabba’s Rancor Pit multipacks. As we reported last week, the LEGO C-3PO from The Force Awakens has started hitting Toys”R”Us stores around the country. 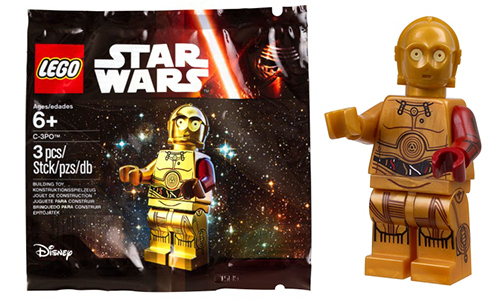 The new Toys”R”Us 2015 Toy Catalog confirms that it will be available for free* with the purchase of $40 in LEGO Star Wars merchandise. Want to know where to save big on Star Wars LEGOs, Blu Rays, and more this weekend? Then join Marjorie and Arnie for the 2014 Black Friday (and Thursday) shopping guide! While the Star Wars bargains are few, there are some choice items for those brave enough to face the lines and the crowds. Listen to this episode to find out what! Then keep listening for the Star Wars Action News annual holiday gift guide! This year has gift ideas ranging from $3.00 to over $7,000! No matter if you’re buying for young or old, man or woman, listen to find what to get the Star Wars collector who seems to already have everything! All this and more in this episode of Star Wars Action News! Big Bad Toy Store has opened its virtual doors to their 2014 Black Friday Sale. 100+ Items On Sale! Ends Monday, December 1st. After being sold out for 3 years – The long awaited documentary THE FORCE AMONG US directors cut was finally released earlier this year! This is the documentary that both fans and critics have been ranting and raving about since it original release in 2007! This “Hallmark Card for Star Wars fans” celebrates fandom and was filmed in Tunisia and Norway where the original Star Wars films were shot. And in case you missed the sequel – THE FORCE WITHIN US – this is still available but is almost sold out!!!! Now is your chance to get both films at the lowest price ever offered! The Deal goes until Cyber Monday! Enter coupon code 30BLK2014 to receive 30% Off your entire purchase of selected In-Stock merchandise. * Sale begins at 12:00 AM Wednesday, November 26th and runs through 11:59 PM Sunday, November 30th. Click on through to check out available items. *Coupon may be used multiple times during the sale period. Coupon is not valid for any pre-orders or any new products released in the past 6 months. Coupon may not be combined with other offers. K & C Collectibles is offering 15% off all in-stock merchandise for orders over $25. The discount coupon is “Thanks2014” and must be keyed into the Redemption Code field during the checkout process. Offer valid from November 16th, 2014 through November 21st, 2014. Offer valid while supplies last. Click the NEW PRODUCT link for a complete list of recently added items. Overall, it looks the Black Friday deals are kind of light when it comes to Star Wars merchandise this year, there is one that has a least some decent savings. Walmart will be offering a 20″ Jakks Pacific 2 pack that includes Ezra and Stormtrooper. The promotion kicks off on Thursday at 6pm, while supplies last. Update: Walmart now has this set on their website (currently not available). Are you the Black Friday Wave 2 Winner? If you see this image, post a comment and the first one that does wins wave 2 of the Black Series! It’s Star Wars Action News’ 8th Annual Holiday Gift Guide and Black Friday shopping companion! Black Friday isn’t what it used to be…it’s not even Friday any more! With sales having started Thanksgiving Day and some stretching through the weekend and even to “Cyber Monday” bargain shoppers now have almost a full week of savings. Stay on target for Star Wars bargains with this episode of Star Wars Action News! Marjorie and Arnie run down the stores with Star Wars items on sale to let you know which bargains are worth fighting the crowds, and which you can sleep through! Also on this episode is the annual Star Wars Action News holiday gift guide! With gift ideas for men, women, and children, and in all price ranges, listen to find what to get the Star Wars collector who seems to already have everything! The entire Star Wars Action News team has contributed ideas. From books to lightsabers, toys to statues, jewelry to original art, it’s all here in today’s podcast! Plus listen to win a set of Star Wars Radio Drama CD-sets from Star Wars Action news and Highbridge Audio!